In part one , we noted that the evangelists had set out to compile a record of Jesus’ life forty to sixty years after his crucifixion, a time when there was no eyewitness testimony left to draw from. They did embrace, however, three arcane tenets that elucidate the basis for the Sea-Walk miracle. First was the Hellenic belief that the constellations were the embodiment of deified characters, animals, and props that had become immortal when transferred into the constellations; what Greek literature refers to as a katasterismos, or “placing among the stars”. One of these still-frames depicted Orion in the act of taking his first step upon the celestial Sea comprised of the eight contiguous watery constellations: Dolphin, Goatfish, Water-god, Southern Fish, Twin-Fishes, Sea Serpent, River, and Ship. Orion appears to be walking upon the celestial sea delineated by the aquatic constellations. Secondly, the evangelists’ own writings affirm their belief that Jesus had ascended into this celestial realm—the implication being that Jesus might be found among these immoral star-figures. And finally, literary evidence implies that the evangelists were familiar with the preeminent tenet of the Babylonian astrologer : that the constellations portrayed hallowed, celestial “writing” that divulged revelations through the medium of punning. When the evangelists turned to the firmament in the late 1st century AD, their awareness of Hellenic celestial mythology informed them that Orion was in the act of “sea-walking”. Moreover, Mesopotamian astrological arcana had instructed that Orion was called the “Son-god” (DINGIR DAMU), and that polysemous readings of this cuneiform spelling rendered the terms “Son of God” and “Anointed-One” (i.e., “Christ”)—the supreme epithets for Jesus. To the Gospel authors this must have felt like a revelation: the inviolable, pictographic record of monumental history had commemorated a miracle that had been performed by their founder, Jesus Christ. Wordplay enciphered in Orion’s cuneiform titles rendered “Son of God” and “Anointed-One” (Christ); the two definitive epithets for Jesus. Yet more than just Jesus’ astronomical identity was enshrouded in Orion. We’ll now see that the Sea-Walk miracle’s commonalities and startling incongruences can also be traced to a stellar tableau and encrypted wordplay that appears whenever the Sea-Walker constellation, Jesus-Orion, reaches the zenith. Here, readers are reminded that the cuneiform writing system displayed a vast array of homophones (e.g., to, two, too). This linguistic phenomenon imparted sacred puns to the evangelists, which were then used to compose the “Sea-Walk” narratives. To discern these arcane wordplays it is crucial for readers to understand the transliteration system modern linguists use to differentiate which cuneiform sign appears on a tablet. The following image illustrates this system, using the six cuneiform signs that can be read “MUL”. The sign most frequently written “MUL” does not have a subscript number; the second most common form of “MUL” is transcribed MUL 2; the third most frequent writing of “MUL” is transliterated MUL 3, etc. Noteworthy is that AB 2 served as an esoteric form of “MUL”, which modern researchers transcribe as MUL x. Important to remember is that the subscript numbers and subscript x are a modern convention ; ancient scholars would have read all six of these cuneiform signs as “MUL”. The evangelists give a consistent, nondescript setting for the Sea-Walk miracle. All versions state that Jesus instructed the apostles to take a boat ( ploion) to the other side of the Sea of Galilee while Jesus “went up” ( anebē) or “departed” ( apēlthen, anechōrēsen) to some unnamed “mountain” ( oros) so that he could be “alone” ( monos). Matthew and Mark specify that the purpose of this retreat was “to pray” ( proseuxasthai). During the voyage the disciples’ boat encounters a rough sea due to a “contrary” or “great wind”, which threatens to sink their ship. Jesus is then seen walking on surface of the water towards the disciples’ boat. Let us begin by tracing the pictorial characters and props from the Sea-Walk miracle to their correlates in the stars. The setting is easily distinguishable in the celestial sky visible to the Gospel writers in the late 1st century AD. We have shown that evangelists’ epithets for Jesus (“Son of God”; “Christ”), were embodied in the cuneiform titles of Orion, the Sea-Walker constellation. Thus Jesus, in the guise of Orion, can be seen treading upon the celestial “sea” delineated by the eight, coterminous aquatic constellations. Immediately northeast of Orion stood Gemini, called Mashu, “Twins”, in cuneiform. Mashu was often conceptualized as a “Twin Mountain” in Mesopotamian mythology, evinced by the fact that Gilgamesh climbed them in tablet IX of The Gilgamesh Epic . The main prop in Jesus’ Sea-Walk is the disciples’ boat, which correlates with Argo, the ship constellation stationed just southeast of Jesus-Orion. How the Argo may have come to be envisioned as the boat full of “disciples” is found in grammatical esoterica of the Mesopotamian astrologer. The Greek Argo appears to be the derivative of a Mesopotamian “Cargo-Ship” written Makurru in Akkadian, or MA 2-GUR8 in Sumerian. Cuneiform literature describes the Makurru-boat as a divine ship constellation stationed in the southern reaches of the night sky; and it has its prow torn off in a popular religious myth. 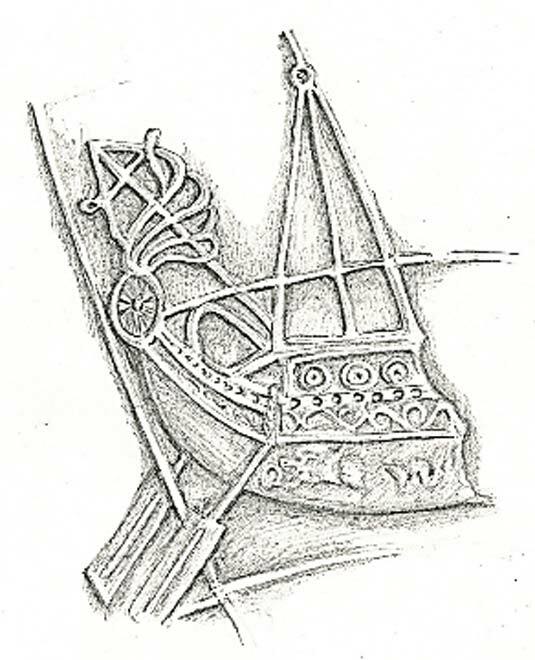 Thus it’s hard to imagine a better correlation between two constellations: the Greek Argo—like the Mesopotamian Makurru-boat—is a deified ship positioned in the southern region of the night sky that, astonishingly, is missing its bow! But it’s a pun encoded in the Argo’s Sumerian title, MA 2-GUR8 (MA 2 = “boat”, GUR 8 = “deep-going”), that exposes its role during Jesus’ Sea-Walk miracle. Among its many readings and meanings, GUR 8 was also read TUR 5, thereby phonating TUR, a Sumerian term that could mean “scholarly apprentice”. The latter correlates precisely to the Greek word mathētēs, “pupil, apprentice”—the word English Bibles render “disciple”. The plural, “disciples”, was probably conveyed by the fact that a Sumerian singular noun can represent a collective. Thus, when the Gospel authors turned to Argo they knew its Sumerian spelling, MA 2-GUR8, phonetically imparted MA 2-TUR, “Disciples’-Boat”. 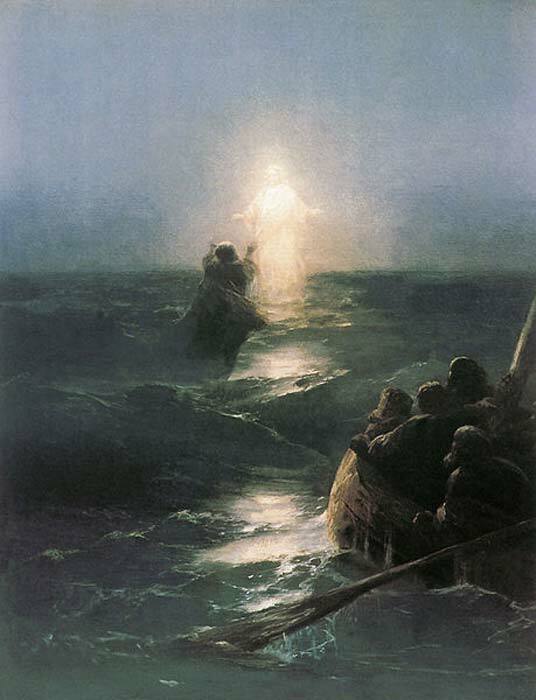 Hence, Jesus’ Sea-Walk miracle involves Jesus coming down from a mountain to walk on the sea near the disciples’ ship. Jesus’ actions prior to the actual Sea-Walk can be found encrypted as celestial puns in the astral Sea-Walker tableau. Positioned immediately northwest of Jesus-Orion was Taurus, which sometimes went by the astronomical title Eluu (“Bull”), a homonym with the verb eluu, “to go up, depart”—a direct correlate with Jesus’ behavior in the Sea-Walk vignette. Moreover, the logogram for Taurus, GUD, formed a homophone with GUD 6, which represented karābu in Akkadian, “to pray”. And just east of Jesus-Orion stood the “Horned-Serpent” constellation, Hydra, whose Sumerian name USHUM, also meant edishshu in Akkadian, “aloneness”. It seems that these words dictated Jesus’ behavior leading up to his sea-walk: Jesus-Orion “Went Up, Departed” to the Mountain-Gemini, “Alone, to Pray”; divine communiqués that Matthew, Mark, and John reported as fact in their Gospels. Jesus’ behavior before the Sea-Walk conforms to celestial wordplay encrypted in nearby Taurus and Hydra. We’ll now see how celestial puns interjected the jarring discrepancies into Jesus’ Sea-Walk miracle. While Jesus was walking on the surface of the Sea of Galilee towards the apostles’ sinking vessel, Mark 6:48 incorporates the following statement “he wanted to go by them” ( ēthelen parelthein autous ). Why Jesus “wanted to go by” the apostles’ floundering ship has nonplused theologians. J. Marcus writes, “Jesus’ desire to pass his disciples on the sea is puzzling … if Jesus’ sea walk is motivated by his concerns for his disciples … why does he attempt to pass them in 6:48?” Two astronomical aspects of the stellar Sea-Walk tableau elucidate why Mark incorporated this irrational detail into the narrative. In ancient (and modern) astronomy, Orion was depicted as a striding, deified man whose head is turned backwards as if looking behind him. The pictographic representation of Orion walking upon the astral sea and looking backwards at the disciples’ boat (Argo) probably influenced Mark’s interpretation of this stellar still-frame, i.e., Jesus-Orion looks as if he has just walked past the Disciples’ Ship (Argo). The concept appears to have been echoed in a fairly obvious astronomical pun. Orion’s Akkadian cuneiform title was Rē’u/“Shepherd”, which was sometimes represented by the logogram U 5. And U 5 formed a homophone with U, the logogram that meant shūtuqu in Akkadian, “to move past a person or another object”. Hence, when Mark gazed up at Jesus-Orion, the heavenly Sea-Walker’s head was turned backwards—as if peering back at the disciples’ ship (Argo). And phonetically embedded in Jesus-Orion’s cuneiform title was the logogram U/“moving-past-an-object-or-person”. Mark apparently construed this bizarre pun as an unassailable fact that had occurred during the Sea-Walk, which he then reported as factual detail in verse 6:48. As Jesus was about to be taken into the apostles’ boat at the conclusion of his Sea-Walk, John 6:21 informs that “immediately came the boat at the land to which they-were-going.” Since the Sea of Galilee is approximately seven miles wide, and John 6:19 tells us that the apostles had rowed out three or four miles, the apostles’ ship was instantly teleported the remaining three or four miles! This supernatural feat correlates with celestial puns encrypted in the cuneiform terms for the “disciples’ boat” (Argo) and adjacent river (Eridanus). A common logographic spelling for Argo was MA 2-GUR8, “ Makurru-boat”. MA 2 meant “Boat”; and besides meaning “deep-going” GUR 8 also represented the Akkadian verb erēbu, “to arrive”. GUR 8 was also read KUR 9 and KU 4. The former phonates the Sumerian word KUR, “land”; the latter vocalizes the logogram KU, “at”. The notion of an instantaneous landing came from a polysemous reading of the river constellation’s title. Sumerian-Akkadian dictionaries verify that the river deity’s name was written, DINGIR I 7, the “god River”. John’s familiarity with Babylonian astrological esoterica informed him that DINGIR was also read AN. Thus, the river’s cuneiform title could impart AN-I 7, or “AN-I”; which vocalizes the Akkadian ani, “immediately”. Thus, when John observed the stellar tableau of Jesus’ Sea-Walk, he found the words “Immediately, Arrives, the Boat, At, the Land” encoded in the Disciples’ Ship (Argo) and adjacent river constellation (Eridanus). These words compelled John to incorporate a supernatural teleportation of the disciples’ boat in John 6:21. Matthew 14:29-31 maintains that Peter stepped out of the boat and walked upon the surface of the sea with Jesus for a short time until his faltering faith caused him to sink! We’ll now see that Peter’s celestial identity can be traced to Orion, the Sea-Walker constellation that also embodied Jesus. “Peter”, or Petros in Greek, meant “Rock, Stone”—specifically a portable sized “stone” or “rock”. This name is embedded in Orion’s Akkadian identity as a Rē’û/“Shepherd.” Sumerian-Akkadian dictionaries confirm that an alternate logogram for Rē’û/“Shepherd” was SHUBA, and that SHUBA also represented a valuable type of “stone, rock”. Hence one of the names encrypted in Orion’s cuneiform title was SHUBA/“Rock”, which corresponds precisely with the Greek Petros. Because Matthew had also discerned the name “Rock” in Orion’s cuneiform title, the Sea-Walker’s supernatural talent was transferred onto Peter/“Rock”; whom this evangelist portrayed sea-walking alongside Jesus. Ironically, the evidence for Jesus’ Sea-Walk miracle has been visible in plain sight for the past two-thousand years. When the evangelists peered up at the inviolable record of monumental history that had been etched into the constellations, they saw the name “Christ” embedded in Orion, a deified man striding across the celestial sea. Additional puns enciphered in the Jesus-Orion Sea-Walker tableau elucidated the stories’ smooth commonalities and jolting incompatibilities, which the evangelists reported as factual history in their Gospels. By John McHugh, M. A. It does seem like an awful lot of steps. I won't dispute that the Gospel writers were familiar with the stories needed to be influenced in this manner, as you seem to have sources for it (which I'll explore one day). But the theory requires an awful lot of steps and has the feel of reaching to justify the inferences. It seems like we could get about as far in our analysis by saying that the Gospel writers had many potential influences for the story of "Divine being in human form walking on water." And, to me at least, that's not quite the same claim as that Orion and Jesus represented the same figure, which is what seems to be argued here. Read more about Was Orion the Heavenly Overlord of Stonehenge?